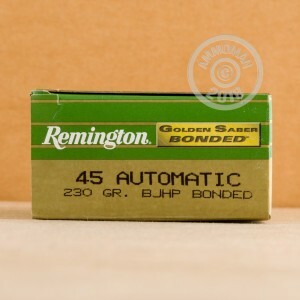 Remington Golden Saber ammunition features a brass-jacketed bonded core bullet designed to strike an assailant, deliver strong penetration, and expand while retaining its mass for timely incapacitation of an assailant. This combination helps resolve self-defense situations quickly and decisively. This .45 ACP version benefits greatly from the added penetration of the Golden Saber design and uses a standard pressure load that will work well in a wide variety of 1911s and other .45 pistols. 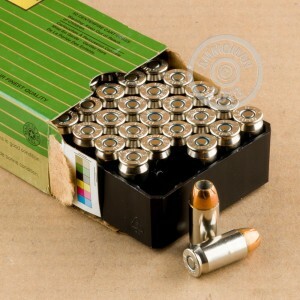 Each case of Golden Saber ammunition contains 500 cartridges with non-corrosive Boxer primers and nickel-plated brass cases. 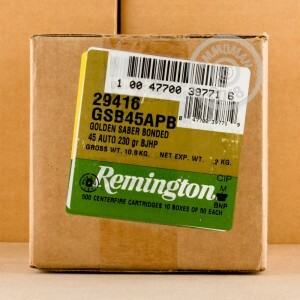 AmmoMan.com is a great place to pick up premium ammo by the case. We offer free shipping on all orders over $99, so you pay only the list price.